Hi there, I'm Jesse. I grew up in Goshen, NY, a town about 1.5 hours outside NYC. I went to school at F.I.T. in NY. I took two years of fine arts, then transferred into their Toy Design program. It took me a while to figure out that I wanted to work in animation, but once I did my career path became a lot more focused. If I could go back in time I would have applied to a great animation school but that technology hasn't been invented yet. The Toy program helped teach me to be a professional and how to be a hard and productive worker. It basically straightened me out. However, learning to draw for animation, I had to do by my lonesome. I figured out fairly early that working in toys wasn't really for me and During my 3rd year of college I can remember looking into an "Art Of" book for the first. I was blown away by all the amazing work that goes into making an animated film, and I knew that it was something I had to be a part of. It also showed me that the quality of work being done in the industry is ridiculously good, so I set out to be able to produce work that I felt like could be up to par. That is a long and ongoing journey. I usually start off by gathering a lot of reference. You can easily generate ideas by looking at what something actually looks like before exaggerating or caricaturing. Make it easy on yourself because it should be fun! Nothing you draw should be generic so if you're doing a soldier for example, you want to know what their uniforms look like era specific, what gear they carry, even to see what expressions they make in photos. It is a great way to get ideas for little touches that really push a character to the next level, for example: is the character's face dirty or bandaged? what type of gear are they carrying? do they lean over from the weight of their equipment? all good questions to ask before designing or add during the design phase. Then I sketch.. a lot.. usually I start out on paper to get a lot of ideas down quickly, if I start the initial phase digitally I may end up just drawing layer after layer on top of one sketch. After I have a lot of nice explorations down on paper I scan them. I put all the good ones on one page and look at them all together. From there I start digitally sketching over the top of them, adjusting proportions and shapes or making sure the poses and silhouettes are strong while adding in costuming details. Then clean (for me that can mean it still looks rough but good to present to client or for personal use) and then the easy part, color! I don't worry a whole lot about color, because if the design, i.e., the shape language, silhouette, gesture, expression are all looking nice then color is just the icing on top. You already did the hard part. Right now I am working as a freelancer. I start off with cereal (special K) and coffee (illy). Since I am freelance my days vary a lot after that. People I interact with are usually a producer or art director. I always try to make time for personal projects or cafe sketching, life drawing or drawing from the TV. Then I may browse the net looking for more work! Sorry if you are one of the people I keep emailing. My first break into the animation industry was at Titmouse. I worked on a bunch of different projects there. My first gig was as a character layout artist on Motor City. After they told me that I was taking a test for character layout I pretended like I knew what it was then went and looked it up online. 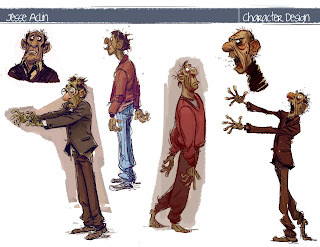 Then I was fortunate enough to land a job with Reel FX as a character designer for a film called Turkeys. I am working with them again on a film called Book of Life. 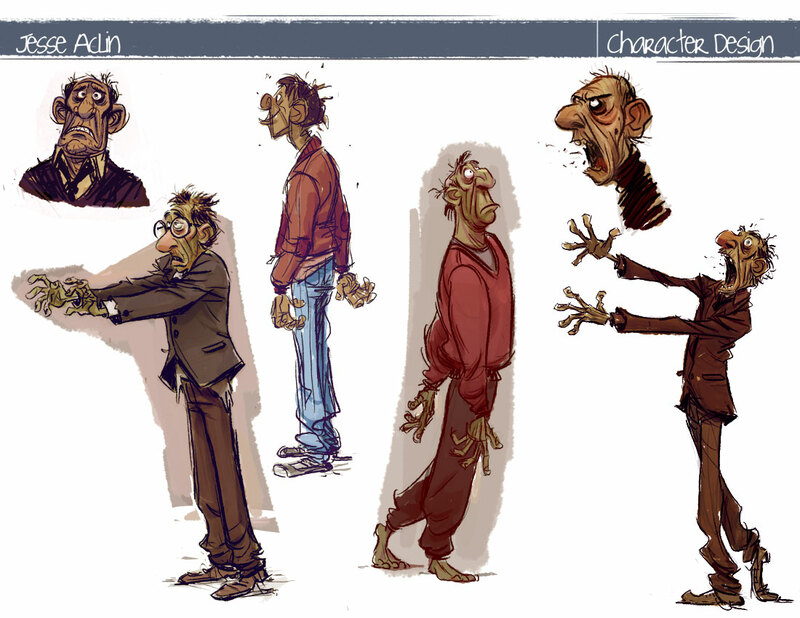 I just finished up doing character designs for Curious Pictures on a project in the early stages of development. I worked on a few projects with the good folks at Nathan Love, check them out they do great work! Anything where I feel like I achieved what I set out to do and grew and learned a thing or two while doing it. I constantly change my process but the one constant is trying to improve and tell stories through the character so If that comes across then I'm cool with it. Book of Life with Reel FX. Also working on a few personal projects I hope to turn into art books. Soooo many people's work inspires me. I try and look at good art every day! This isn't really fair to name a few because there are hundreds maybe thousands, but here is an abridged list in no particular order: Tom Gately, Shiyoon Kim, Bill Schwab, Nico Marlet, Nate Wragg, Ronald Searle, Shane Prigmore, Clement De Ruyter, Uwe Heidschoetter, James Robertson, Daniela Strijleva, Tony Fucile, Glen Keane, Milt Kahl, Chris Sasaki, Marc Sylvain, Maxime Mary. Sorry to anyone left off. I use Photoshop to color. I change up my process a lot but here goes.. I block in the shape of the character (sketch is already done) then lock the pixels on that layer or create a mask of that shape. Then I choose the colors, blocking them in. From there I will do some multiply layers to try and get the values looking good. Maybe do some screen (highlights), color dodge (bright highlights or lighting effects) and overlay (color adjustment and blending) layers. There are a few vital steps I have that are done throughout the process, these are level adjustments and color balance layers. They are a life saver. Most fun and easy for me is the initial sketch exploration. After the reference is collected and decisions are made about the character, then you get to really be creative and throw a whole bunch of ideas at the wall and see what sticks. Most difficult would be making sure that the character tells a story. It is easy to play with shapes, proportions, repeating shapes, and size differential for days but to have a drawing that can tell you all about a person is a rewarding and extremely difficult task. I like to watch movies. I try to observe certain things and think why they are making the decisions they make. Watching people is fun and easy to do in a city like New York, there a lot of people and they all have weird quirks that are fun to observe and to later on add into your work. I like to cafe sketch, and go life drawing so that I stay sharp. I guess I just always trying to see things like a kid and try to appreciate how varied and entertaining life is. O yeah, I also like to watch high brow and low brow TV. That really helps put things in perspective. The Incredibles was an amazing movie. They really created a design language that played all the way through. If you see a pencil from that world out of context you can probably guess that it came from that movie. People. Like I said before they are so weird. You can create any number of characters based on people you've seen. My father worked for Marvel for a bit, so that was definitely an inspiration. I didn't really take art too seriously though until I saw the "Art of Books". Until then I didn't know what went into making those projects. Once I saw all the amazing work and artists and how fun it looked to be a part of that, then my career was set into motion. Hearing tips from artists that you respect a lot is a great way to learn. Everyone, more or less knows what goes into making a nice picture, but to hear how different people compartmentalize things and what they most concentrate on is a great tool. Reading Drawn to Life by Walt Stanchfield was a huge step in me becoming a "professional". Forget "how to" books, just go read those. It's really hard. It is equal parts rewarding and big let down, especially when first starting out. The great thing about it is that you can learn and grow every day. Every time I feel like I make a huge breakthrough I realize there is so much more I need to learn. It's like climbing a mountain, getting to the top and then realizing there is another mountain up there that is even bigger that you have to climb. My advice would be to just work hard everyday, be inspired and try to create inspiring work. O yeah and move to LA, everyone keeps telling me that, so I think I should also follow that advice. From my blog I link to my Tumblr, Twitter, and Instagram where I post a lot of in development stuff. I will definitely have some things coming up soon! please keep checking with my blog and twitter for info on that.